Thinking of an old brick wallpaper for your space but find it hard to picture in your room from those BORING stock photos when you’re shopping online? Mine are included…I’ll admit it! 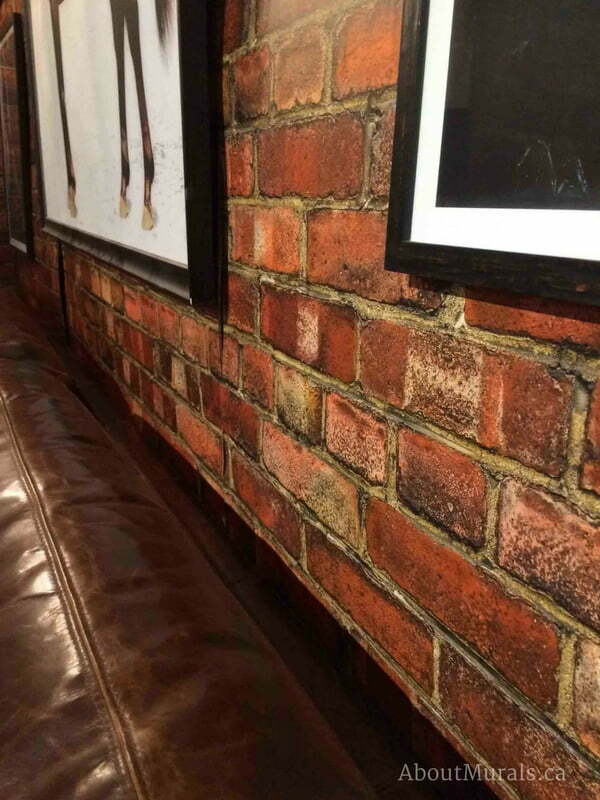 Well, I’ve spent hours rounding up pics of my old brick wallpaper from clients so that you can see it in action and get totally inspired (scroll down to see them). The old brick wallpaper that has NO repeat pattern! Sorry for the totally boring stock photo of my old brick wallpaper, BUT I wanted to show you the pattern without any furniture in front of it. So you can see that there is no repeat pattern that you get with regular wallpaper. The reason is that mine is actually a wallpaper MURAL – a high resolution photograph taken of a real brick wall. This gives you the most realistic look possible. It’s removable…especially important when working on TV sets! One huge hesitation I hear from people all the time when I mention the dreaded word “wallpaper” is that it’s too hard to remove when they’re ready to redecorate. All of my wallpaper murals are totally removable. You just pull the panels right off. I even put together a how-to video explaining how to take it off the wall. This is especially important for TV sets like on Cityline, where designers are changing out walls weekly. They don’t have time to sit there scraping wallpaper off. 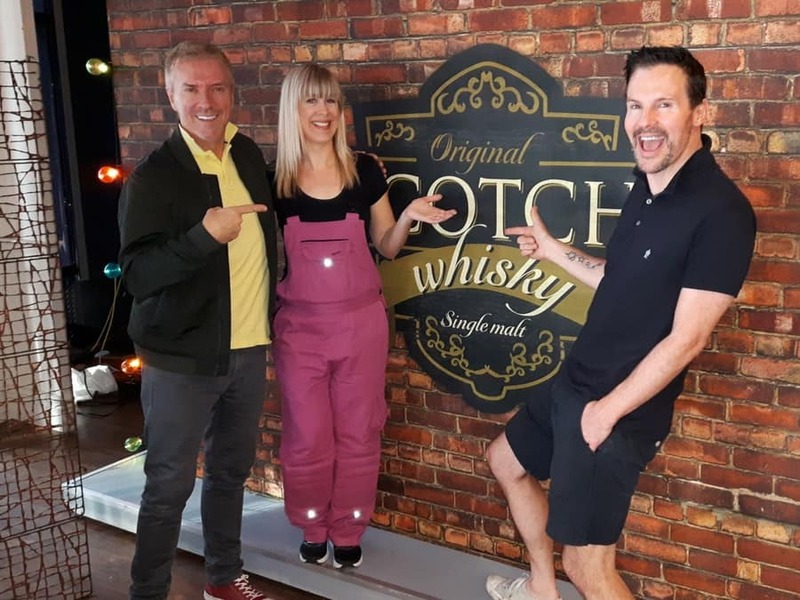 I had the pleasure of working with Colin and Justin on a Cityline episode using this old brick wallpaper. Yup…that’s me in the pink overalls! 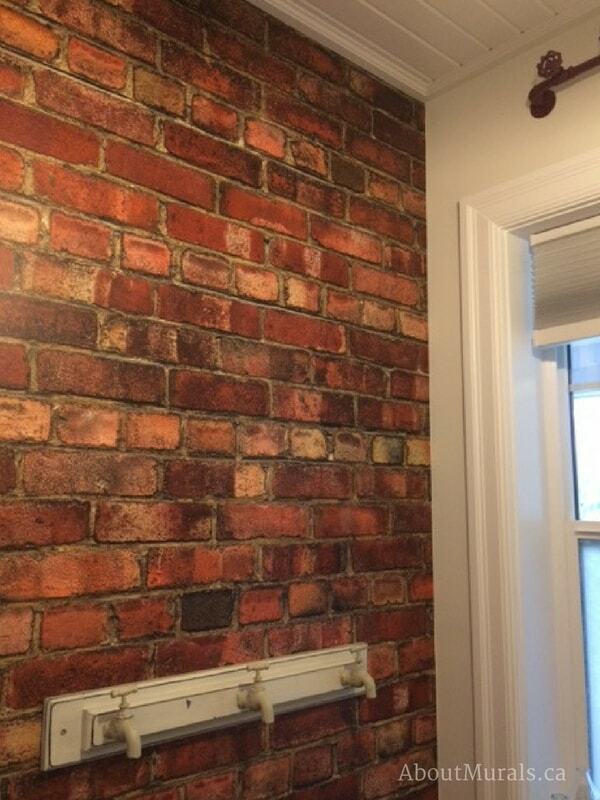 My red brick wallpaper is so crisp and clear, you’ll hardly believe it’s not real! Why? The photographer takes 72 small, individual photos of a large brick wall (including all the texture in the grout and holes in the brick) and then stitches each pic together in Photoshop. The result? 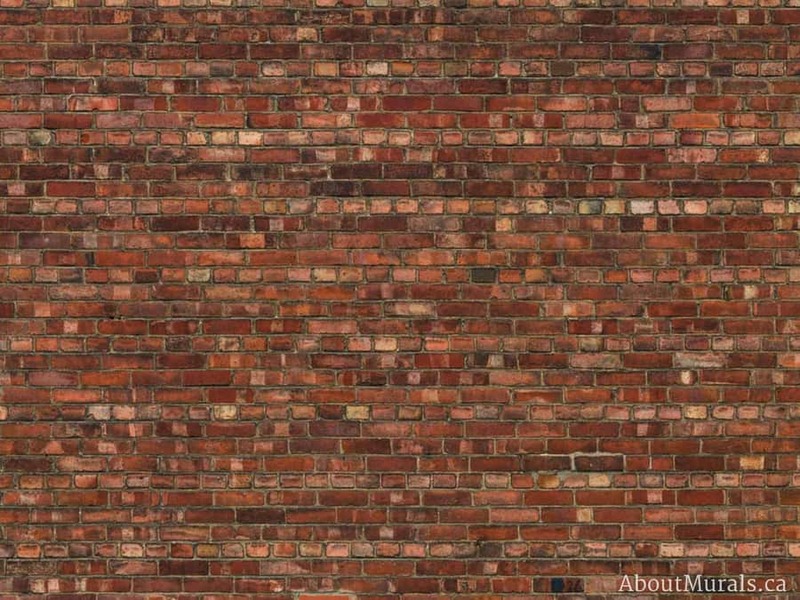 A super high resolution photograph of a brick wall that is perfect for printing in large scale. This customer took a closeup photo of the wallpaper so you can see the quality of the image. 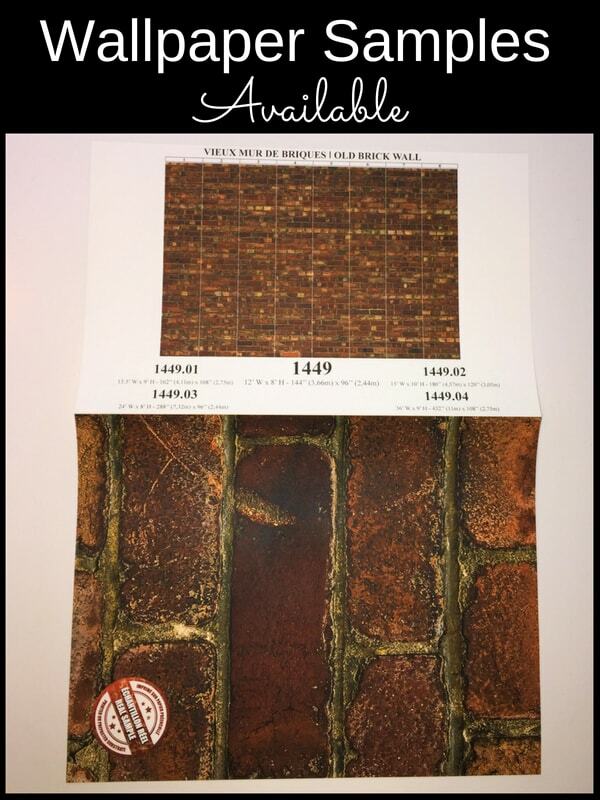 Shop all my Old Brick Wallpaper designs! My wallpaper murals are perfect to use in high moisture rooms like bathrooms and laundry rooms. It won’t peel off or curl up. So – do you love the vintage faucet hooks to hang your towel? Or do you prefer a regular towel rod? Either way, both can be hung over top of the wallpaper. It’s super easy to hang, too! For all my DIYers out there, I made a how-to-hang-this-fab-wallpaper video just for you! But for anyone who is not interested in hanging it yourself, there are 2 options. If you’re in Southern Ontario, I offer installation services. If you live elsewhere, check out the Wallcovering Installers Association for someone in your area. 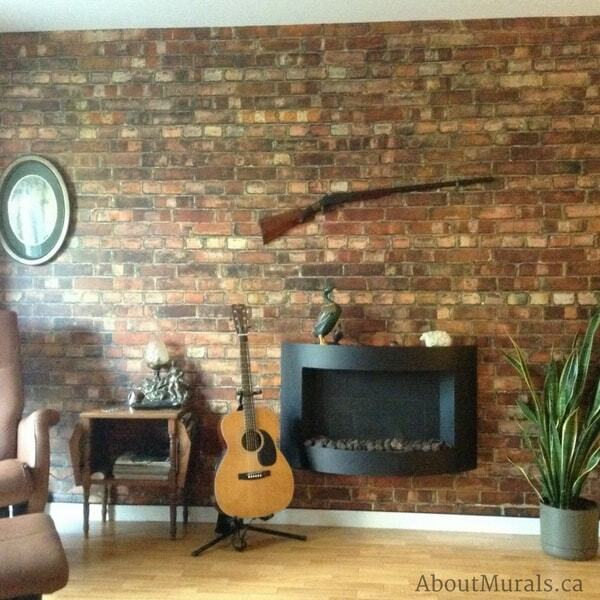 This customer hung the brick wallpaper themselves, creating an awesome man cave. Even though my customer pics are stunning, you still might want to see the wallpaper up close and in person. If this is you – you can order a wallpaper sample! See the colours and feel the quality of the wallpaper. Feeling unsure about shopping online? If you liked looking at these wallpaper murals and love a hot deal, why don’t you become a part of my newsletter community? You’ll get more inspo and hear about my latest wallpaper sale or coupon codes.